﻿Welcome to our historic railroad depot preservation web site. We hope you will take a few minutes to explore our site and get to know what we are all about. If you have a love of history, trains, railroading, historic buildings or all of the above you are among friends. Feel free to contact us for more information about our depot. Unfortunately the orginal depot was damaged beyond repair in the winter and spring of 2012. Over the following summer our depot was dismantled and the site was cleared of debris. 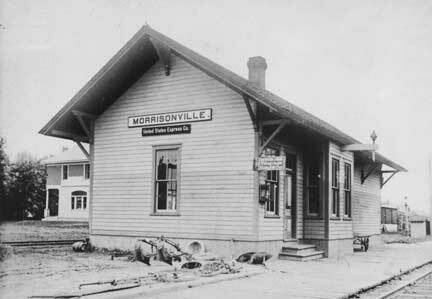 We did save some of the architectural details and our hope is that someday we will be able to build a replica of the depot on the land the Society owns near the Morrisonville Post Office. Please note that this site is under construction. MDPSI was established in January 2002 in Morrisonville, Wisconsin. Our mission is to save and restore the ~110 year old depot located on the former Milwaukee Road, Madison & Portage (M&P) line that runs through Morrisonville. The line is currently an active Canadian Pacific route. 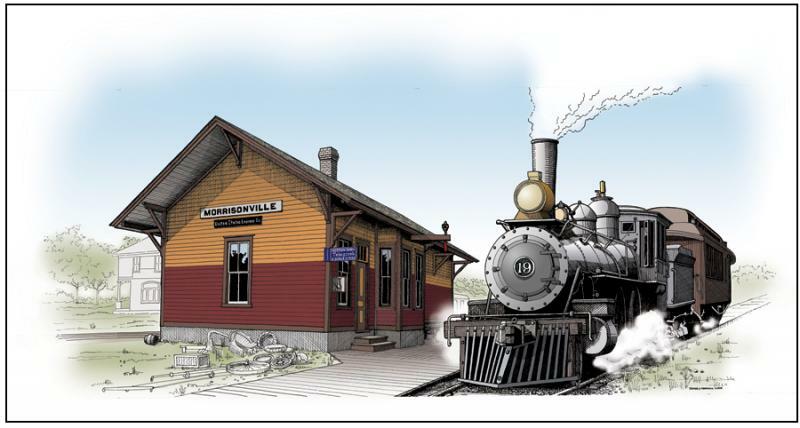 Make a donation and receive a 18x12" signed print by artist Tom Morrison, great-great-grandson of James Morrison I, founder of Morrisonville. Suggested donation $30. plus $5 shipping. Use the form on the Contact Us page or just send us a check for $35. and we'll send one to you. Printed on acid-free paper with archival inks.